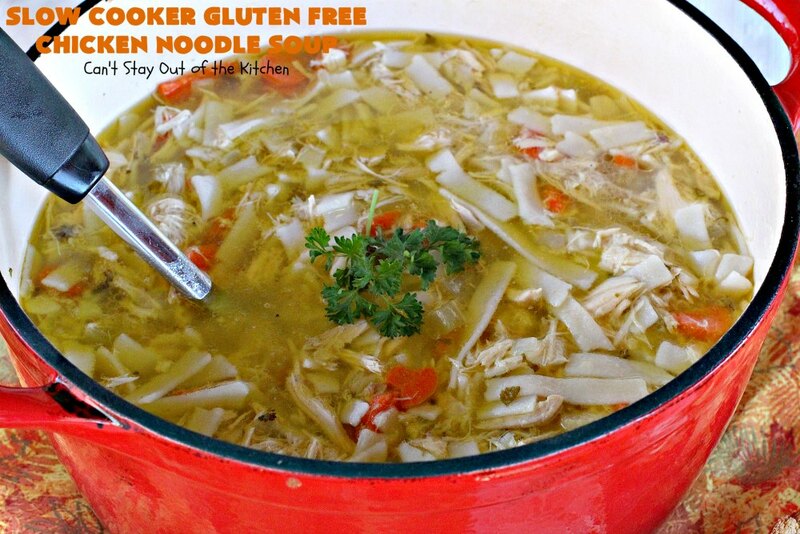 Oh, my, Slow Cooker Gluten Free Chicken Noodle Soup is drool worthy! It sure hits the spot when you’re feeling a little under the weather, too! I made up a large pot of this soup earlier this week when John and I were both dealing with sore throats. 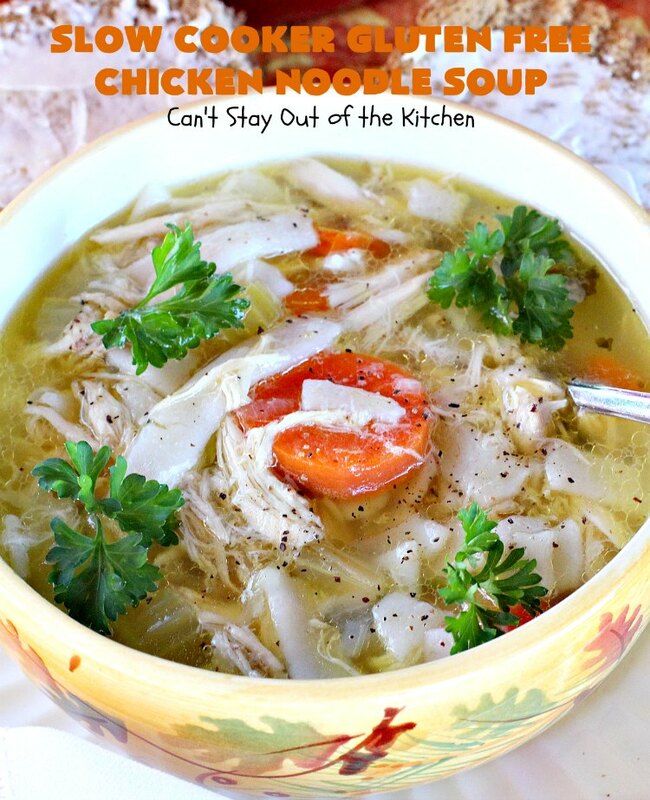 There’s nothing quite like Chicken Noodle Soup to speed up the healing process and make you feel a little better! My husband wanted to just stop at Boston Market and pick up some. But I wanted to have some to eat all through the week so I came up with this from-scratch recipe. First, I wanted the ease of making this in the slow cooker so this recipe is pretty easy. 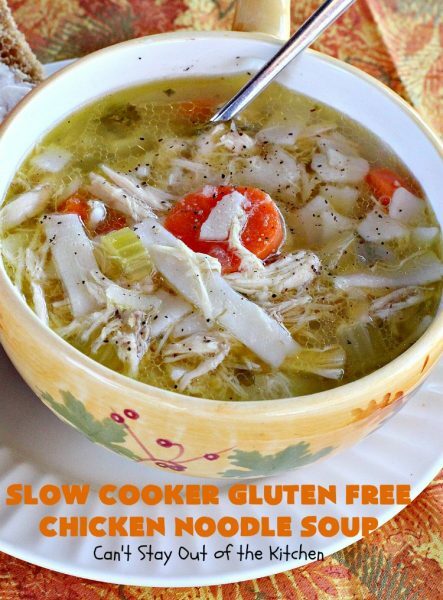 Second, I wanted to make it gluten free for those who would love a good Chicken Noodle Soup recipe but need to use gluten free noodles. Quite frankly, I don’t think my husband even noticed that the noodles were GF brown rice fettuccine noodles rather than regular noodles. Of course, he’s getting used to my experiments by now! 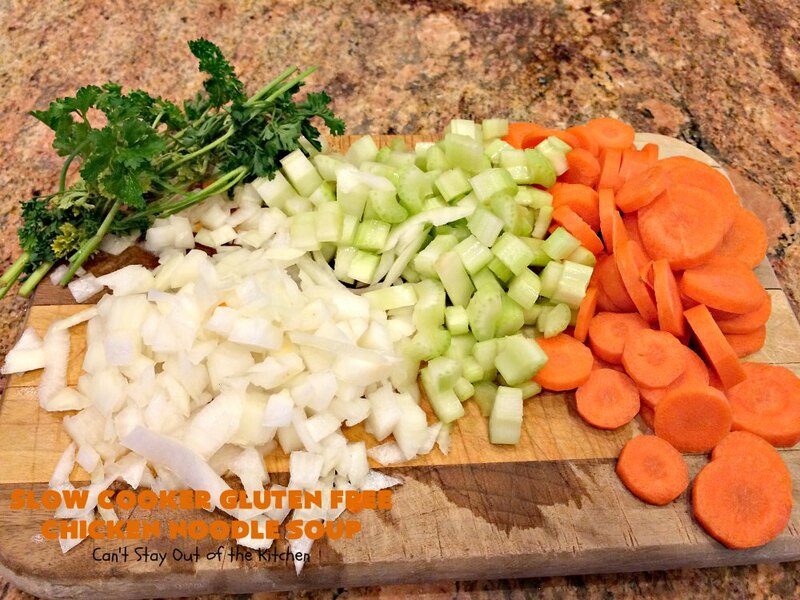 This soup is really simple, really easy, and really tasty. It’s just what the doctor ordered for whatever ails ya! If you’re looking for a healthy, from-scratch Chicken Noodle Soup recipe, then you will love this one. 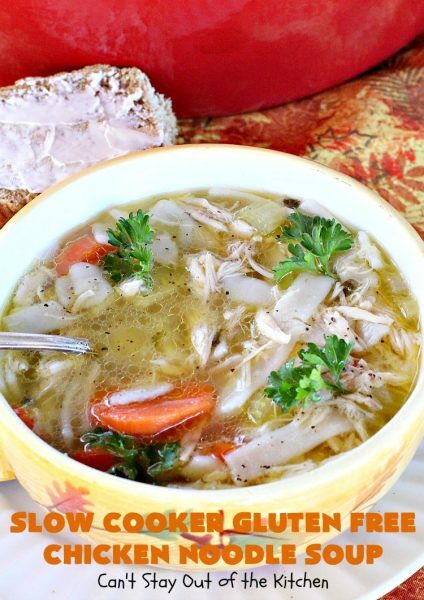 It makes a lot because I use the broth and meat from a whole chicken, but you will have plenty of leftovers for lunches or for extra meals. Enjoy a bowl today! 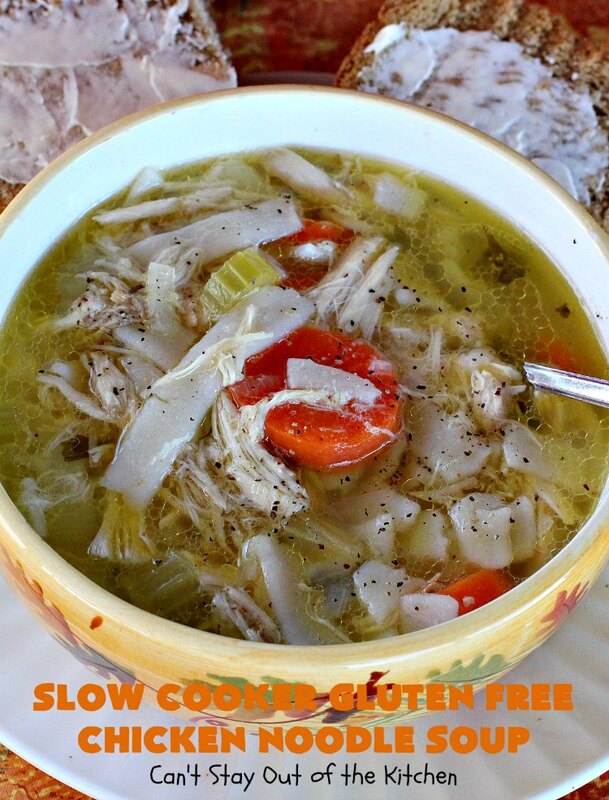 Slow Cooker Gluten Free Chicken Noodle Soup is great for what ails ya! Each bowlful is savory and mouthwatering. 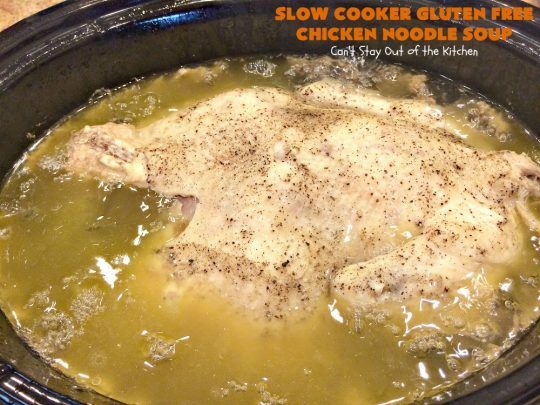 This recipe makes up a lot because I use a whole chicken and about 4 quarts of water from beginning to end. 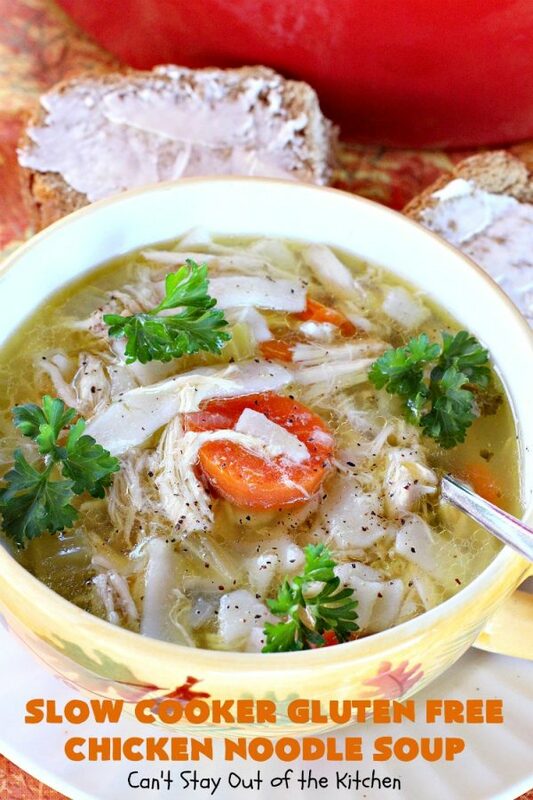 Studies show that chicken soup has medicinal value. We certainly think so! 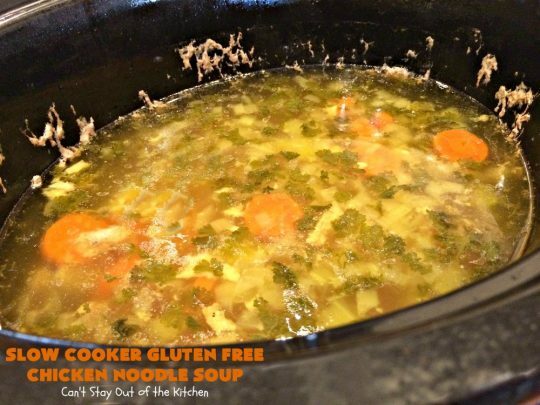 This recipe is great any time of the year, but especially during cold season. Cook off a whole chicken. 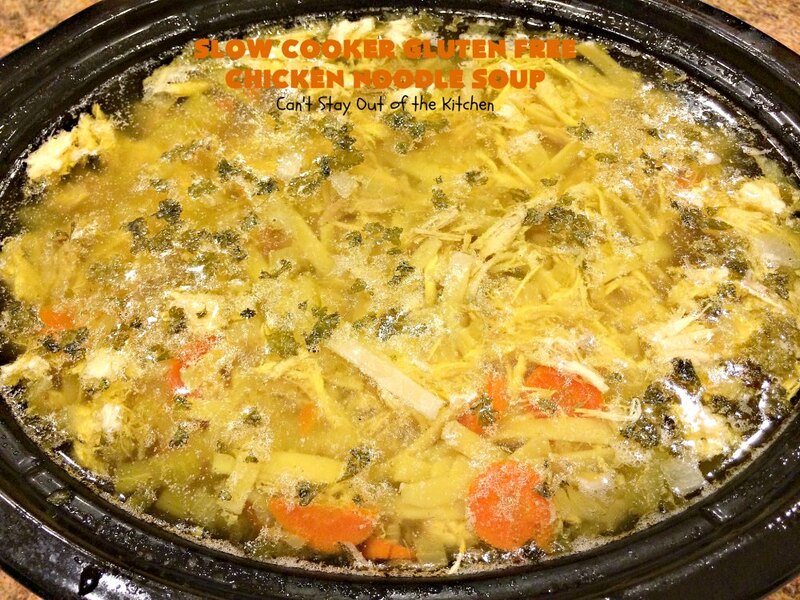 Put a chicken in a large 7-quart crockpot. Fill with water and sprinkle generously with salt and pepper. It will take about six hours on high (some crockpots may cook faster). Cut up veggies for soup. Add veggies after about four hours. 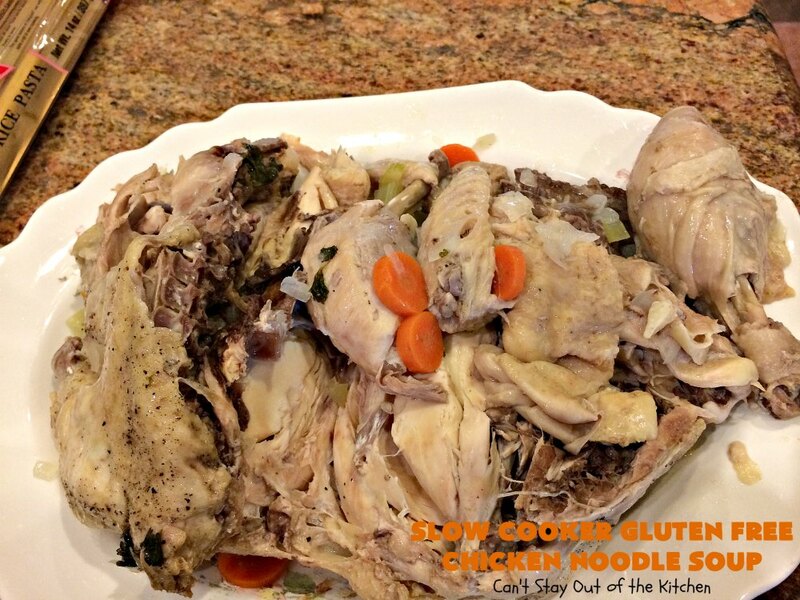 Remove chicken from crockpot and debone. For Tips for Deboning Chicken see my post. I added the veggies back into the soup, but removed all bones, fat, gristle, tendons, and stuff like that and discarded it. Here I’ve removed the chicken to debone. I added water to within about two-three inches from the top. It took about 2 quarts. 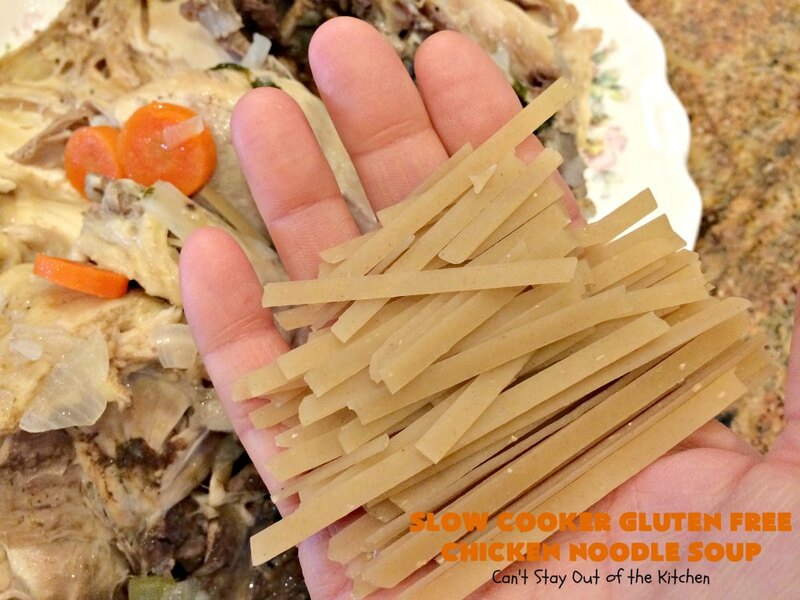 I broke the gluten free fettuccine pieces in half, then in half again and tossed them into the crockpot to cook while I was deboning the chicken. The noodles were ready by the time I got done because I rarely get a chicken deboned in less than 45 minutes. Here I’ve added all the shredded chicken back into the crockpot to heat through. This big chicken yielded about 8 cups! Check soup for seasonings. Add more salt, pepper and fresh parsley to your desire. Here’s what Slow Cooker Gluten Free Chicken Noodle Soup looks like when finished. 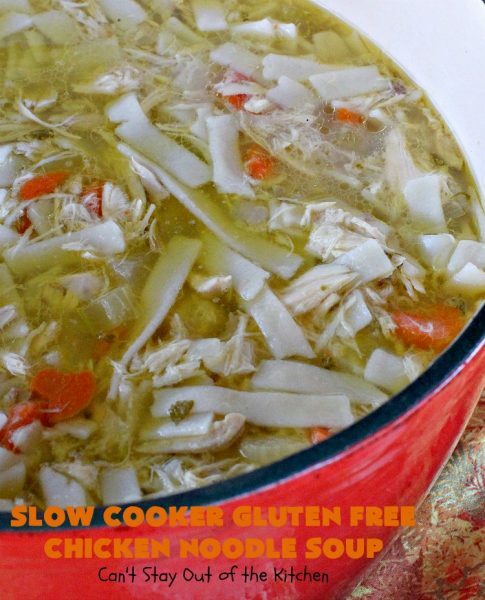 Rendering the fat from the chicken in the slow cooker makes for a rich, tasty broth for your soup base. 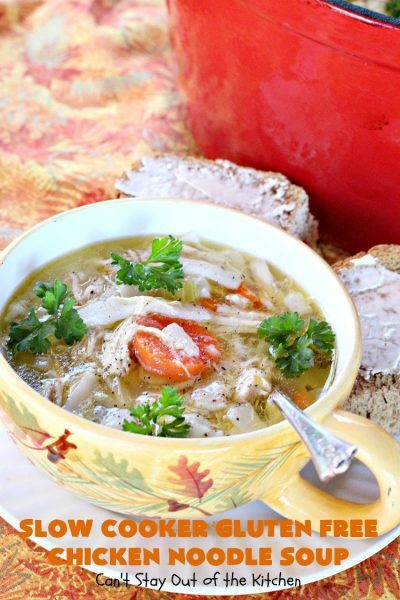 As the chicken cooks down the fat and other nutrients are leached from the skin, meat and bones providing a very healthy, medicinal soup. Doesn’t Slow Cooker Gluten Free Chicken Noodle Soup look terrific? I added more salt and pepper and fresh parsley to my serving. This delicious homemade Chicken Noodle Soup recipe is just what the doctor ordered! 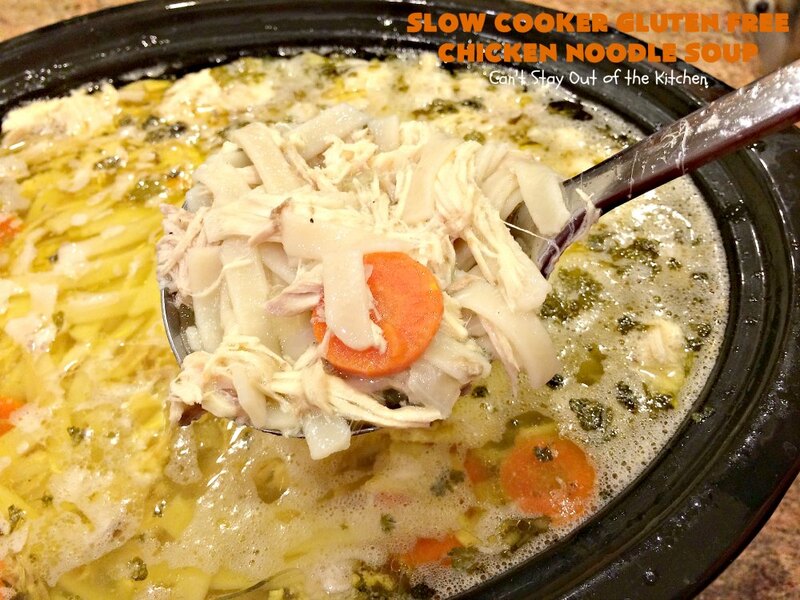 It's made in the slow cooker with gluten free noodles and is so savory and mouthwatering. It's perfect for fall when comfort food is on the menu! Place chicken in 7-qt. crockpot and cover with water. Sprinkle very generously with salt and pepper. Cook on high about 6 hours until chicken is cooked thoroughly. After about four hours, add carrots, celery, onion, parsley and salt and pepper to crockpot. Continue cooking an additional two hours until chicken is done. Remove chicken from pot to debone. Add an additional quart or two of water to the crockpot – enough to bring the chicken broth level to about 2-3 inches below the surface. Carrots and celery should be fork tender by now. Add fettuccine noodles broken into fourths. Cover and continue cooking while deboning the chicken. Remove fat, gristle and bones and discard. Shred remaining chicken pieces into bowl. Mine equaled about 8 cups of shredded chicken. Stir into crockpot and continue cooking until noodles are cooked through. My noodles took about 20-30 minutes. Check soup for seasonings. Add more salt, pepper and fresh parsley, to taste. NOTE: Included in the preparation time is about 45 minutes to debone the chicken. Delicious homemade Chicken Noodle Soup recipe that’s made in the slow cooker with gluten free noodles. Savory and mouthwatering! Included in the preparation time is about 45 minutes to debone the chicken. You will enjoy each mouthful of this simple, easy and tasty soup. For those on a gluten free diet, now you can enjoy one of your favorite recipes with no less taste. I didn’t season this with a lot of herbs. Instead, I kept it very simple and allowed all the deliciousness from the chicken broth to be the main flavors of this soup. I learned something new. I did not realize you could buy gluten free pasta. Thanks for sharing! Your pictures truly look amazing! Yes, I buy it and gluten free flours all the time. Thanks for stopping by, Diane, hope you are doing well.